© Richardson and Garavan; Licensee Bentham Open. A number of studies have documented high levels of hypomanic symptoms in those diagnosed with depression, suggesting a potential misdiagnosis of bipolar disorder as unipolar depression. Research suggests that undergraduate students have high levels of depression, but whether such misdiagnosis occurs in this population has not been examined. The aim of this study was therefore to examine levels of hypomania in undergraduate students reporting diagnosed depression. An international sample of undergraduate students completed the 32-item Hypomania Checklist (HCL-32). A cohort was analysed for this study, consisting of female undergraduate students reporting a formal diagnosis of depression (n=28). Participants scored high on the HCL-32, with a mean total score of 19.9 (SD=5.4) out of 32. Overall, 85.7% (n=24) scored equal to or above the original cut off point of 14 suggested for bipolar II disorder. Two possible conclusions are suggested by this study. Firstly, there are high levels of hypomanic symptoms in undergraduate students diagnosed with depression, suggesting that a formal diagnosis of bipolar disorder should be pursued in those with high scores. Alternatively, the cut-off points previously suggested for the HCL-32 may not be accurate for use with undergraduate students. Keyword: Hypomanic, Hypomania Checklist, Bipolar Disorder, Unipolar Depression, Undergraduate Students. Bipolar II disorder is a chronic affective disorder characterised by episodes of major depression and hypomania . A hypomanic episode is characterised by symptoms such as flight of ideas, a decreased need for sleep, elation and talkativeness. These symptoms occur within an elevated or irritable mood which lasts for at least 4 days . There are a number of important diagnostic issues regarding the effective diagnosis of bipolar disorder, such as the minimum duration of a hypomanic episode required for diagnosis . It has been suggested that manic and hypomanic symptoms are not recognised as readily as depressive symptoms for a number of reasons, including a lack of subjective suffering, a lack of elevated mood and seasonal rhythmicity . Perhaps due to these diagnostic controversies, a number of studies have documented high levels of previously unrecognised hypomanic symptoms in those with a unipolar depression, suggesting possible incorrect diagnosis [4-9]. For example Ghaemi et al. found that 37% of those who received a diagnosis of unipolar depression met the diagnostic criteria for bipolar disorder. Incorrect diagnosis as unipolar depression may have a number of negative consequences, such as treatment with antidepressants rather than mood stabilisers, which can cause rapid cycling . On the other hand, early identification and treatment of bipolar disorder is associated with a better outcome . It is important to increase the detection of hypomania in order to better distinguish between unipolar depression and bipolar II disorder. Systematic evaluation of hypomania has been found to double the estimated prevalence of bipolar II disorder . Consequently it has been suggested that bipolar II disorder is in fact as prevalent as, or more prevalent than, unipolar major depression . In order to optimise detection of hypomania and bipolar II disorder, a number of tools have been developed for clinical practice. Cassano et al. developed a structured clinical interview (SCI-MOODS), and Hirschfeld et al. developed a self-report measure, the Mood Disorder Questionnaire, to screen for affective disorders including bipolar disorder. Angst et al. have developed a self-report questionnaire, the 32-item Hypomania Checklist (HCL-32), to detect hypomania in those with depression in order to optimise diagnosis of bipolar II disorder. A number of studies have documented high levels of depression in undergraduate students [14,15]. However, no studies have examined levels of hypomanic symptoms in undergraduate students with depression. This study therefore aimed to examine scores on the HCL-32 in a sample of female undergraduate students reporting a formal diagnosis of unipolar depression. Participants were recruited by emails sent via psychology departments in the U.K., Ireland, the U.S., Australia, New Zealand and Canada. Participants were also recruited via posters in Trinity College Dublin, and some took part as part of a research credit scheme. The participants described here represent a small subset of this initial data set, and consist of female undergraduate students of British, Irish, U.S., New Zealand or Canadian nationality, who self-reported that they had, at some point in their lives, been formally diagnosed with unipolar depression. Using these criteria, a total of 28 individuals remained. Ages ranged from 18-42, with a mean age of 24.3 (SD=6.2). Nationalities were 35.7% (n=10) British, 21.4% (n=6) Irish, 14.3% (n=4) U.S., 7.1% (n=2) Canadian, 14.3% (n=4) Australian, and 7.1% (n=2) New Zealander. Participants completed a brief demographics questionnaire created by the researchers for the purposes of this study, which included questions about previous formal diagnoses of mental illness. Participants also completed the HCL-32 . This is a self-report questionnaire of 32 questions, which measures the severity of previous hypomanic episodes by asking participants to “Try to remember a period when you were in a ‘high’ state” . The HCL-32 has two subscales; ‘Active or Elevated’ and ‘Risk-Taking or Irritable’. Total scores range from 0 to 32, with a score of 14 or more distinguishing major depressive disorder from bipolar disorder with a sensitivity of .80 and a specificity of .51 . Additional studies have validated the HCL-32 in a number of different countries, demonstrating good psychometric properties [16-20]. This measure and the demographics questionnaire were completed online. Ethical approval was granted by the Trinity College Dublin School of Psychology research ethics board. Scores on the HCL-32 ranged from 10 to 30 (out of 32), with a mean of 19.9 (SD=5.4). Fig. (1) demonstrates the cumulative percentage of total scores on the HCL-32. Overall, 85.7% (n=24) scored equal to or above the cut-off point of 14 for bipolar II disorder as suggested by Angst et al. in their original validation of the HCL-32. A total of 92.9% (n=26) scored equal to or above the cut-off point of 12 for bipolar disorder suggested by Carta et al. . Table 1 displays the percentage of the sample that scored equal to or above the various HCL-32 total score cut-off points as suggested by previous validation studies. Cumulative percentage of scores on the HCL-32. Percentage of Sample Scoring Equal to or Above HCL-32 Cut Off Points Specified from Previous Validation Studies. Scores on the ‘Active or Elevated’ subscale ranged from 7 to 17, with a mean of 14.2 (SD=2.9). Scores on the ‘Risk-Taking/Irritable’ subscale ranged from 0 to 7 with a mean score of 2.8 (SD=1.9). Angst et al. report that a score of two or more on this subscale distinguished between bipolar I disorder and major depressive disorder with a specificity of 62% and a sensitivity of 62%. In the current sample, a total of 67.9% (n=19) scored 2 or more on the Risk-Taking/Irritable subscale. This study examined scores on the HCL-32 in a sample of female undergraduate students who reported having been formally diagnosed with unipolar depression at some point in their lives. 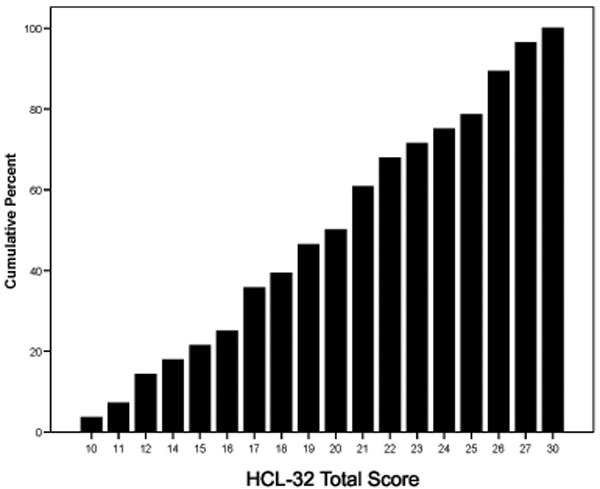 The results suggest high scores on the HCL-32 in this group, with the vast majority of the sample scoring equal to or above the cut-off point suggested by Angst et al. . Many also scored equal to or above the various other cut-off points suggested by other validation papers. These cut offs were variously suggested to discriminate major depression from bipolar I and/or bipolar II disorder, bipolar I from bipolar II disorder, and bipolar (I or II) disorder from other axis I disorder or controls. Scores were also high on the two subscales, with the majority scoring equal to or above a cut off on the Risk/Taking-Irritable subscale designed to discriminate bipolar I disorder from unipolar depression. The means noted here are similar to the work of Meyer et al. in a non-clinical population, with many individuals scoring above the various suggested cut-off points. If the cut off points suggested by previous studies are used, then the current results suggest that the majority of the undergraduate students in the current sample were diagnosed with unipolar depression when they may, in fact, have high levels of hypomanic symptoms, and thus potentially meet the criteria for bipolar disorder. If the cut off point of 14 given in the original validation paper by Angst et al. is taken, then 85.7% of the current sample have sufficiently high scores to suggest the possible presence of bipolar II disorder. However it should be noted that self-report measures such as the HCL-32 are often intended for screening followed up by a clinical interview, and thus scores on this measure alone are not necessarily indicative of bipolar disorder, but rather suggest that further examination is required. Although previous studies have found high levels of hypomanic symptoms in those with depression, suggesting potential misdiagnosis, the levels here appear to be particularly high. Previous estimates of the proportion of those diagnosed with unipolar depression who meet the diagnostic criteria for bipolar disorder are 37.5% , 56.8%  and 61.3% . This suggests that high levels of undergraduate students have been diagnosed with unipolar depression though they may experience hypomanic episodes and thus it is possible that they meet the criteria for bipolar II disorder. Therefore clinicians at university health clinics should be careful to systematically screen for hypomania in those presenting with depression. The HCL-32 may serve as a useful clinical tool for initial testing, to be followed up by a structured clinical interview. However, it is important to consider another explanation for the findings. The sensitivity and specificity of the HCL-32 for discriminating unipolar depression from bipolar disorder has been variously reported at .80 and .51 , .8 and .54 , .68 and .83 , and .82 and .67 , and .85 and .79 . These studies have demonstrated moderate specificity; nonetheless some false positives are expected. On the other hand, some false negatives are also expected. Thus it is important to consider the possibility that the suggested cut off point may be too low for use with an undergraduate population. This may be due to the lower age of the sample; Meyer et al. found significantly higher scores on the HCL-32 in younger non-clinical participants. The mean age of the undergraduate sample in this study was 24.3, whereas the other validation studies had a much higher mean age. For example, the Italian sample used in the original validation by Angst et al. had a mean age of 43.2 years. Thus undergraduate students in general, as well as those diagnosed with depression, may score higher on the HCL-32 on average than other populations. Therefore for undergraduate students a higher cut off may be necessary in order to optimise sensitivity and specificity. Angst et al. estimated that around 50% of those with major unipolar depression in fact belong to the bipolar spectrum. If it is assumed that 50% of the current sample are bipolar, then a cut off point of 21 or above on the HCL-32 would appear to be appropriate for undergraduate students, as exactly 50% of the sample scored equal to or above this. However, a study comparing scores on the HCL-32 in undergraduate students with bipolar disorder and unipolar depression comparatively is required to confirm what cut-off is appropriate for this population. There are a number of limitations with this study which need to be considered. First, the sample size is small, in particular when compared with previous validation studies on the HCL-32 [13, 16-20]. Second, the sample is entirely female, whilst the various cut off points were designed for both male and female patients. Similarly the sample is international, and thus the cut off points may not be accurate for all of the nationalities represented, as previous work has demonstrated higher mean scores in different nationalities . Third, a depression diagnosis was determined only via self-report, and thus there is a problem with validity of this diagnosis. An alternative sampling method using university mental health clinic outpatients would be quite valuable. A related point is that the sampling method used here is prone to a number of problems and biases, in particular due to the self-selection that may have occurred. Despite the limitations of this study, these results may be important as they suggest one of two possibilities, both of which have important implications for those working with students with depression. Firstly, there appear to be high levels of hypomanic symptoms in female undergraduate students with a diagnosis of unipolar depression. This in turn suggests that many of these individuals may meet the diagnostic criteria for bipolar disorder. Alternatively, the cut off points on the HCL-32 suggested by previous research with older adults may not be appropriate for use in this population, as high scores are common. As earlier research has documented high levels of depression in undergraduate students , either of these possibilities is important for clinical practice. Future research using larger samples and validated depression diagnoses is needed to further study the area of recognition of bipolar disorder in undergraduates presenting with depression. TR conceived the research question and participated in its design. TR collected, entered and analysed data, and reviewed the relevant literature. TR drafted the first version of the manuscript. HG participated in the conception, design and coordination of this study. Both authors contributed to and approved the final manuscript. No funding was obtained for this research, except for approximately €30 for printing from the School of Psychology, Trinity College Dublin. Thanks to Sophie Velleman for her advice on the preparation of this manuscript. American Psychiatric Association. Diagnostic and Statistical Manual of Mental Disorders In: Text Revision. 4th ed. Washington DC: American Psychiatric Association 2000. Angst J, Gamma A, Benazzi F, Ajdacic V, Eich D, Rossler W. Diagnostic issues in bipolar disorder Eur Neuropsychopharmacol 2003; 13: 43-50. Cassano GB, Dell’Osso L, Frank E, et al. The bipolar spectrum: a clinical reality in search of diagnostic criteria and an assessment methodology J Affect Disord 1999; 54: 319-28. Ghaemi SN, Boiman EE, Goodwin FK. Diagnosing bipolar disorder and the effect of antidepressants: a naturalistic study J Clin Psychiatry 2000; 61: 804-. Allilaire JF, Hantouche EG, Sechter D, et al. Frequency and clinical aspects of bipolar II disorder in a French multicenter study: EPIDEP Encephale 2001; 27: 149-58. Akiskal HS, Benazzi F. Optimising the detection of bipolar II disorder in outpatient private practice: toward a systematization of clinical diagnostic wisdom J Clin Psychiatry 2005; 66: 914-21. Benazzi F, Akiskal HS. Refining the evaluation of bipolar II: beyond the strict SCID-CV guidelines for hypomania J Affect Disord 2003; 73: 33-8. Ghaemi SN, Scach GS, Chiou AM, Pandurangi AK, Goodwin FK. Is bipolar disorder still underdiagnosed? Are antidepressants overutilized? J Affect Disord 1999; 52: 135-44. Hirschfeld RM, Lewis L, Vornik LA. Perceptions and impact of bipolar disorder: how far have we really come? Results of the National Depressive and Manic-Depressive Association 2000 survey of individuals with bipolar disorder J Clin Psychiatry 2003; 64: 161-74. Franchini L, Zanardi R, Smeraldi E, Gasperini M. Early onset of lithium prophylaxis as a predictor of good long-term outcome Eur Arch Psychiatry Clin Neurosci 1999; 249: 227-30. Angst J, Cassano G. The mood spectrum: improving the diagnosis of bipolar disorder Bipolar Disord 2005; 7(Suppl 4): 4-12. Hirschfeld RM, Williams JB, Spitzer RL, et al. Development and validation of a screening instrument for bipolar spectrum disorder: the mood disorder questionnaire Am J Psychiatry 2000; 157: 1873-5. Angst J, Adolfsoon R, Benazzi F, et al. The HCL-32: towards a self-assessment tool for hypomanic symptoms in outpatients J Affect Disord 2005; 88: 217-33. Webb E, Ashton CH, Kelly P, Kamali F. Alcohol and drug use in UK university students Lancet 1996; 348: 922-25. Vázquez FL, Blanco V. Prevalence of DSM-IV major depression among spanish university students J AM Coll Health 2008; 57(2): 165-71. Wu Y-S, Angst J, Ou C-S, Chen H-C, Lu R-B. Validation of the Chinese version of the hypomania checklist (HCL-32) as an instrument for detecting hypo(mania) in patients with mood disorders J Affect Disord 2008; 106: 133-43. Meyer TD, Hammelstein P, Nilsson L-G, Skeppar P, Adolfsson R, Angst J. The Hypomania Checklist (HCL-32): its factorial structure and association to indices of impairment in German and Swedish nonclinical samples Compr Psychiatry 2007; 48: 79-87. Forty L, Smith D, Jones L, et al. Identifying hypomanic features in major depressive disorder using the hypomania checklist (HCL-32) J Affect Disord 2009; 114: 68-73. Carta MG, Hardoy MC, Cadeddu M, et al. The accuracy of the Italian version of the hypomania checklist (HCL-32) for the screening of bipolar disorders and comparison with the mood disorder questionnaire (MDQ) in a clinical sample Clin Pract Epidemiol Ment Health 2006; 2: 2. Vieta E, Sanchez-Moreno J, Bulbena A, et al. Cross validation with the mood disorder questionnaire (MDQ) of an instrument for the detection of hypomania in spanish: The 32 item hypomania symptoms check list (HCL-32) J Affect Disord 2007; 101: 43-55.